A simple but well-designed small vintage geometric Swedish Kilim rug, Country of Origin / Rug Type: Swedish Rug, Circa date: Mid-20th Century – The neutral ivory and gray color of this vintage mid 20th century Swedish rug create a contemporary piece. This sophisticated flat woven rug uses tone on tone shading and geometric shapes create a feeling of balance and harmony. The artist that created this magnificent kilim rug used line and form to create a pattern that has a distinct sense of order and rhythm. Shades of grays are used to create areas of light and shadow, with the lighter areas towards the middle and darker tones near the ends. This almost gives the vintage Scandinavian rug design the appearance that it is convex, with the ends appearing further away than the lighter tones. This is a beautiful use of a simple color palette and simple lines to create a design that has interest. This rug brings an organic and natural feel through its use of color, but a sense of formality and structure through its use of line. This highly decorative and soft small size rug can easily be used as an accent piece with a larger schemed interior design. That said, this magnificent vintage geometric grey Swedish Kilim rug, could just as easily serve as the central focal point of the smaller room. It would work well with a minimalist or Scandinavian home decor that uses natural tones and hues. This vintage flat woven grey Swedish kilim rug would be an excellent piece to add to an industrial or single color room. Without a doubt, this is quite the versatile vintage mid century modern rug that could fit well into modern contemporary interior designs. 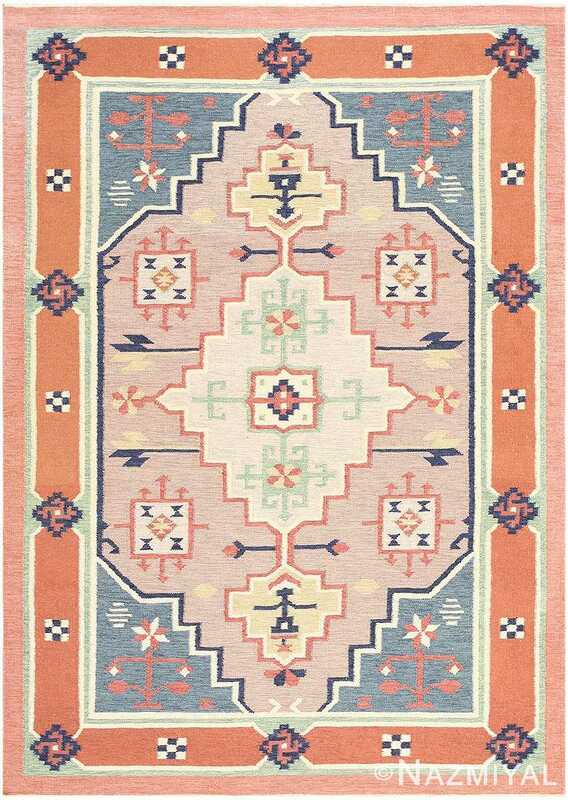 This grey Swedish kilim rug would make a beautiful addition to any modern space that relies on a neutral color palette decor as its main theme. 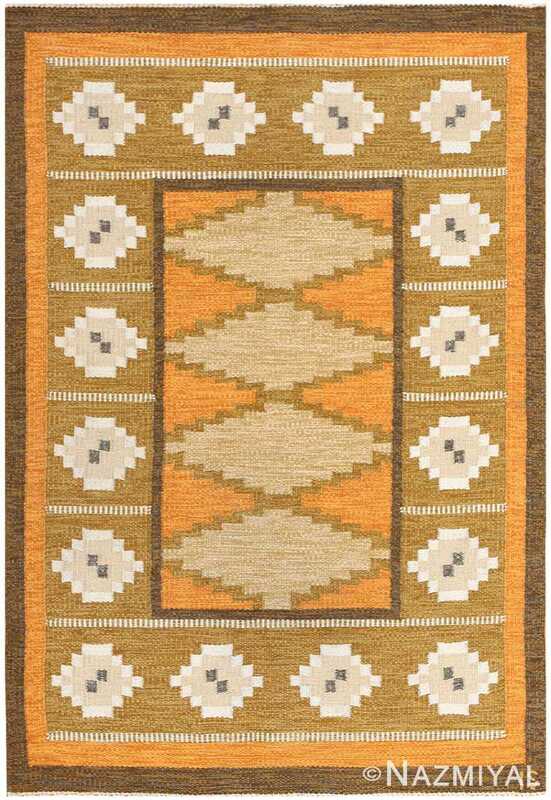 Characterized by a bright pallet and an intriguing design, this mid-century Swedish kilim beautifully showcases some of the more important trends of the style. 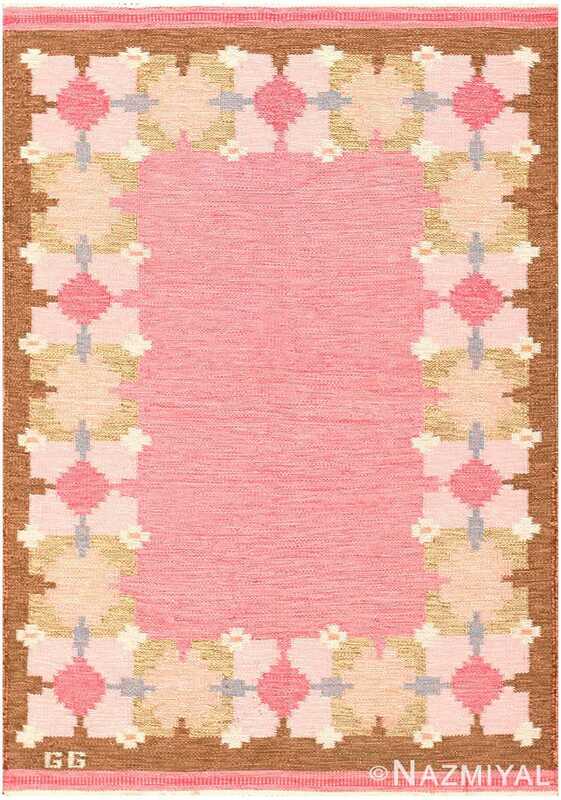 Straightforward and uncluttered, this mid-century Swedish kilim consists exclusively of a simple border of blossoms and an unadorned field of pink.